Supreme quality Fused Tungsten Carbide Powder offered by us is in massive demand in diverse industrial segments. Fused Tungsten Carbide Powder that we provide comprises of unsaturated carbon – sintered, milled and crushed to get the desired results. Clients can avail the same at highly competitive rates. Fused tungsten carbide which has a particularly high degree of hardness and wear resistance. For this reason, it is primarily used in advanced wear protection and tooling technology. Fused Tungstened Carbide , it is called as F.T.C, this is Used for Hard Facing application in various industries. It is very hard due to content of unsaturated carbon -Milled, sintered and crushed to get required grains. The strength & hardness of carbide makes it useful as tough, long-life abrasive grit. 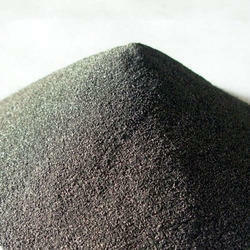 It is used in matrix mixture for various applications and also for hard facing rods. Applications: Fused Tungsten Carbide is generally used to improve hardness and abrasiveness used in diamond Industry to manufacture scap, Grinding Wheel and different cutting tools and etc. We offer Tungsten Carbide Powder for Powdered metallurgy Applications such as Electrical Contacts, Spray Coating , Heavy metal Alloys , Minimg Tools in the range from 1micron to 17 micron(Fsss) , We supplying TC Carbide Powder to various part of world. It is used with chromium, vanadium, molybdenum, or manganese to produce high speed steel used in cutting tools. Tungsten steel is said to be “red-hard or hard enough to cut after it becomes red-hot.